Our jumbo feeder designed for use with national and commercial hives and can take 3.5 gallons of syrup, it is clearly marked for accurate feeding. 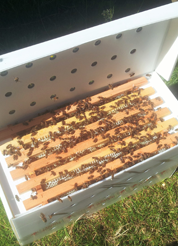 The feeder sits directly on top of the frames, the bees access the feeder via 2 feeder holds, as shown in the images. The feed holes are ribbed to give the bees a good grip.